The Cowan Report: Hammersmith Grove Armadillo Halted – For Now? Work on the notorious Hammersmith Grove “Armadillo” has ground to a halt because the developer has allegedly been unable to obtain bank financing for the scheme. Building magazine told how Development Securities had unsuccessfully been attempting to refinance the project at a time when they reported a £14.4m loss for the past six months. Development Securities released a statement saying that while it had assembled long-term equity partners willing to finance the transaction, the “lack of any currently available bank finance for the development stage left our original equity co-investors unable to proceed with the project as originally planned”. The Armadillo became a highly controversial local issue when residents raised concerns that their needs were being put behind those of the developer. H&F’s ruling Conservative Administration then put out a statement denying that they had met Development Securities to negotiate around its plans only to then have this proved untrue by evidence provided following a Freedom of Information (FOI) request. On the 18th September 2007, Cllr. Mark Loveday (Con) wrote on a local website that “Like anyone else, they [Development Securities] don't have to consult with the Council or the public before submitting a planning application, and they didn't. The Council was presented with their proposals without any real advance notice. 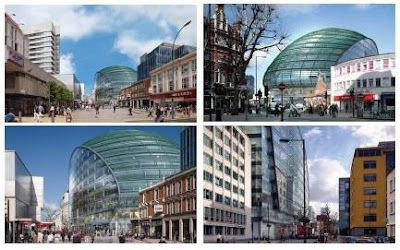 Perhaps had they spoken to us first, we would have told them what would and would not work.” However, the FOI evidence actually showed that Conservative councillors and council officials had met secretly with Development Securities on over 17 separate occasions, which is almost twice a month, to discuss their proposals for the Hammersmith Grove Armadillo. The first meeting took place on 15th November 2006 some ten months prior to Cllr. Loveday’s written statement. This led many local people to believe that the development was a "done deal" and over one hundred and seventy residents raised a wide variety of their concerns with H&F council officials and the developer at a public meeting on 25th October 2007. Unconvinced by what they heard, a further two hundred an fifty residents then turned out on 30th October 2007 to protest against the scheme when it was being considered by the Planning Applications Committee . Following that meeting, many residents told me that they were bitterly disappointed when H&F’s Conservative Councillors used their majority to grant planning permission. The planning committee was chaired by Ravenscourt Park Councillor Lucy Ivimy (Con). It now seems that the construction of the Armadillo has been slowed down rather than stopped. Development Securities said in their statement that “Constructive discussions are now taking place in order that the development can proceed without the need for banking finance”. You can read Building magazine’s full story by clicking here. I attended the planning meeting. It was a shambles and it was obvious from the comments of the council leader, who was in attendance and spoke to the audience, that the planning committee were being told to vote this monstrosity through. Thank God for the banks for halting this. How do we stop it? Councils have very grandiloquent ideas about their ability to 'regenerate' - this NCP development was one of those. Let us hope it stays in the white elephants' graveyard where it belongs. The building was a horrible disaster, a 1960s-type mammoth, insensitive, inhuman, cumbersome, bullying and antisocial. We're well rid of it. Anonymous said that this office building is part of the "regeneration potential of Hammersmith" and the Leader of the Council told us at the planning meeting that he saw Hammersmith's future as an "office hub". Well, I live in Hammersmith and I don't see residential streets like Hammersmith Grove as part of an "office hub". If that's his idea of regeneration then thanks but no thanks!